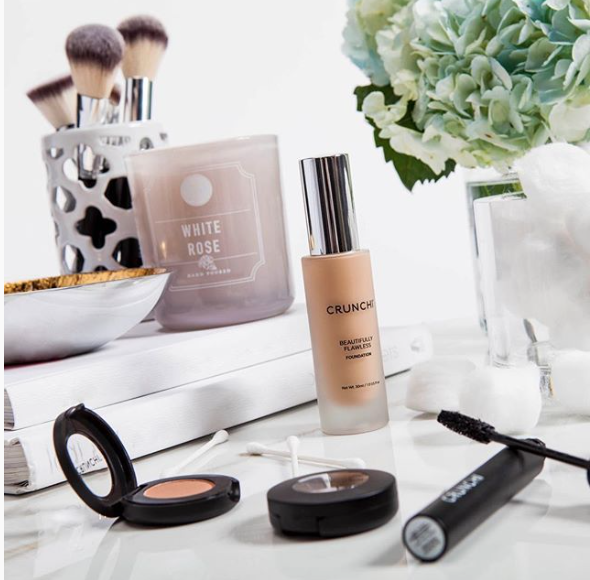 Good Clean Fun with Crunchi Cosmetics. Non-toxic beauty is not just a trend these days, it’s a way of life for many. And for a growing number, it’s become a movement that is helping to educate the public about the harmful ingredients found in popular brands that many of us are exposed to every day. According to a recent article in Forbes.com, the $445 billion beauty industry is a burgeoning market–-and, it seems many women entrepreneurs are the beneficiaries. With those mammoth statistics, I guess it shouldn’t have come as a surprise when my daughter Olivia asked to have a make-up themed party for her twelfth birthday this summer. Spoiler alert: Whether we like it or not, kids are inundated with beauty messaging everywhere they look – on television, radio, and, of course the ever-present social media. 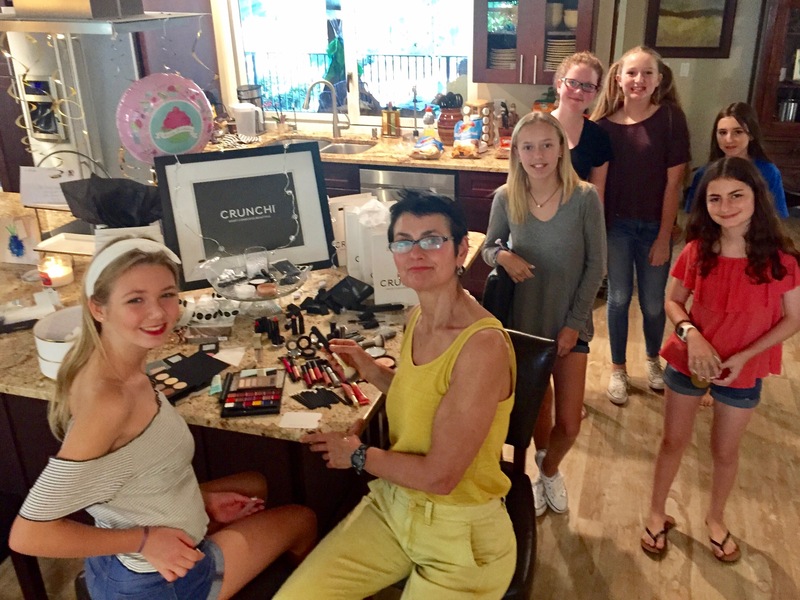 Never-the-less, a make-up themed party for tweens and teens meant being responsible. There are so many toxins associated with cosmetic products on the market. For example, there are dangerous levels of lead in lipstick and even formaldehyde in nail polish. There are already so many pressures and stigmas with beauty and make-up for young girls––and besides the health factor, there is the self-esteem component. It’s a sensitive time, and in many cases young skin can be vulnerable (both figuratively and literally). In the end, I didn’t want to jump into making a haphazard decision that I might regret. Plus, I wasn’t necessarily prepared to give carte blanche to my 12-year-old to use make-up at her discretion. I wanted her to know I was making a thoughtful decision, and that boundaries are important. Truth be told, though, I remember being a bit edgy at her age, and experimenting with make-up too; for me, it was both a creative outlet, as well as a rite of passage. After doing some research, chatting with my husband and a few other moms, we weighed the pros and cons, and decided it was a go! As a side bar, Olivia has always been crafty, so with that, came “experimenting” with all sorts of concoctions over the years. She eventually graduated to developing natural beauty rituals from food and products she found around the house. Things like salt and sugar scrubs to cucumber and pomegranate face masks to avocado hair repair recipes. She also enjoys creating organic soaps from glycerin in different shapes with oatmeal, cinnamon, and other yummy (and safe) ingredients. She gets inspired by YouTube videos and is also a big fan of a dear friend, and clean beauty advocate Dawn Gallagher. Olivia read Dawn’s book, Natures Beauty Secrets, a New York Times best seller, from cover to cover and is borderline compulsive now with all-natural beauty rituals and recipes ;). So, between my daughter’s affinity for homemade farm to table-like products, and me wanting to be a responsible and well-informed parent, I started checking out options. I knew the make-up for the birthday party would have to be clean and natural. As fate would have it, I learned of two local women entrepreneurs who had recently launched a non-toxic line of cosmetics. I’m always motivated by other successful women, and I immediately fell in love with their product line. I was attracted to everything from their personal journeys, to the clean packaging and branding, to the pleasant scents of the non-toxic ingredients. These women did their homework. And the collection does not sacrifice safety or quality for performance. I was impressed. It’s nice to see as consumers are getting more knowledgeable about harmful ingredients in beauty products, that there are more responsible options available. Founders Melanie Petschke and Kelly Weston are both moms of young children and passionate about healthy living. Their make-up and their movement moved me, and I knew I had found the right brand at the right time. Crunchi is a cosmetic line crafted with a combination of safe, certified organic and EcoCert ingredients. It’s a healthy, toxin-free collection dedicated to providing safe, high performing, skin care products. It was a perfect match for the party––and I’ve since become a loyal Crunchi groupie ;). Incredible looking products for faces, eyes and lips for females of any age, including tweens and teens. We even sprung for Crunchi lip gloss for each of the girls as party favors. With Olivia’s guidance, we selected the clear “transparency” color, which was a BIG hit with her friends! My daughter and her friends had a blast at her party …for me it was both an invaluable teachable (and learn-able) moment. It’s refreshing to know there are cosmetic brands on the market that are not just looking out for their bottom line, but actually care about their customer’s health and well-being. 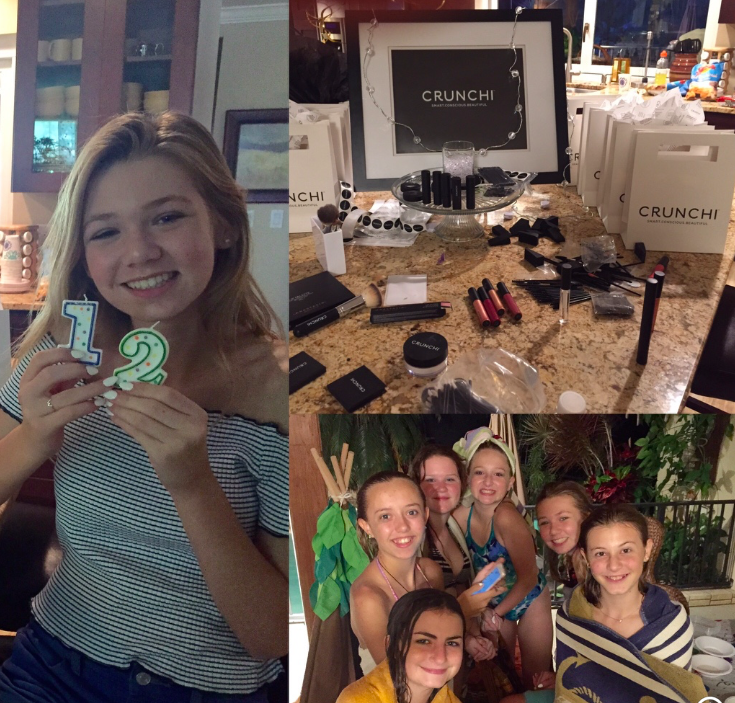 If you are looking for clean cosmetics––or a great party idea for your tween or teen, a make-up party using Crunchi products definitely has my thumbs up! Whether it’s clean cosmetics for your skin, clean products for your home, clean food for your body, or cleaner indoor air quality, it’s nice to have more options available for a cleaner lifestyle!